a 100 megawatt battery, with 129 megawatt-hours of energy, to be built by Tesla and paired with Neoen's Hornsdale industrial wind facility (which I understand has a 100 megawatt (MW) first stage operating and is on its way to a total 309 MW capacity). the choice of twelve 18-cylinder Wärtsilä 50SG engines operating on natural gas for the 225 MW Denton (Texas) Energy Center. The project now has some controversy attached to it, but I don't think it's disputed engines were chosen over turbines due to a superior "ability of the plant to quickly start and stop." The engines are perceived as better complements to variable renewable generators. These all seems to provide flexibility - in the case of the Tesla/Neoen batteries this is a more important aspect than storage. 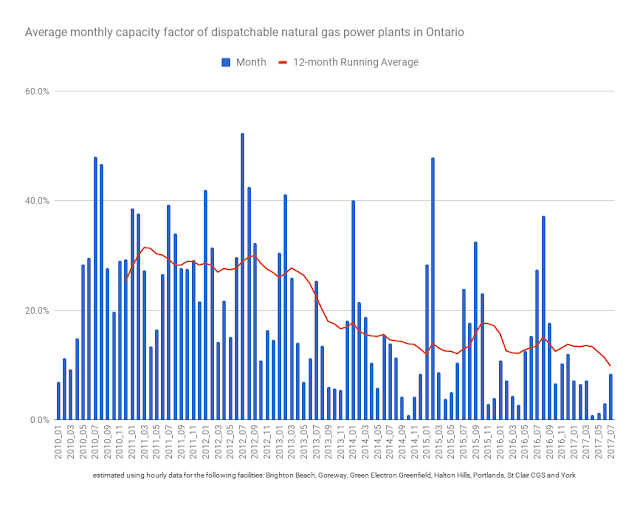 I suggest jurisdictions really learning from Ontario's reductions in emissions will hesitate to enter into long-term contracts with the types of natural gas fueled power plants Ontario did, but alternatives remain uncertain. Generally as a system operator we have noted a decrease in system flexibility over the last decade or so. and as a system operator we frequently encounter what we call hydro-electric lock-outs: a dispatch of a change in output for a hydro-electric facility and then being unable to move it again for a number of hours. We also see decreased flexibility on the system as we’ve increased the number of baseload facilities such as nuclear. Nuclear is a wonderful resource, has added emissions free megawatts to the system – it is able to move but it tends to operate as a baseload facility and if you need flexibility to go ahead and increase output [it] is already producing at its maximum output typically. In Ontario we’ve also noted a change from coal to gas. Coal units were characterized by very low minimum loading points which gave them a lot of room to maneuver. Natural gas facilities have higher minimum loading points and in Ontario when you’ve got increased amounts of baseload facilities over the past few years, and decreases in demand for a variety of reasons, we actually see that we are getting our coal fleet on the line – sorry, our natural gas fleet on the line – less than we used to get the coal facilities on the line. The picture is not all grim. We’ve added some flexibility back into the system. In 2016 we completed an operability assessment at the IESO that assessed the impact of increased quantities of variable generation. We found that the accuracy of the variable generation forecast is very good within an hour, and the accuracy the accuracy of the variable generation forecast is good, but not great, one hour out when you are scheduling imports and exports in and out of Ontario; five hours out, which is the typical time when we are committing our gas units; and 24 hours out when we schedule and commit resources day-ahead. So on this graph … the forecast error is depicted here. The sharp and steep graph is the forecast error that we see within the hour. The point of this slide is that within the hour we’ve got much better information which then feeds into what resources we have to dispatch on to the system. … Bottom line is that we get much better information to go ahead and assess the resource fleet and what we need to do to balance the system within an hour. 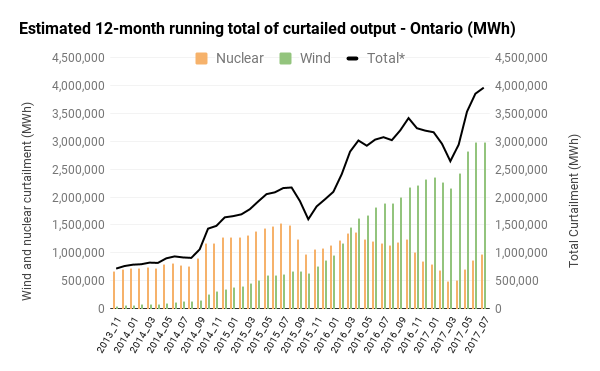 Given that we get much better information within the hour, we find however that there are limited available Ontario resources that are able to respond to supply shortfalls if wind and solar production is less than we expect or if electricity demand is greater than we expect. As a system operator, we need flexible resources today. When conditions exist for short term supply:demand imbalances and we expect there could be a reliability impact, as a system operator we are bringing on resources with longer start-up times that can then provide flexibility should there be an imbalance in real-time where you need the flexibility to respond.